It’s not hard to see wood, papers, cardboard and some other recyclables mixed in the garbage at the Iowa City Landfill in this fall 2012 photo. 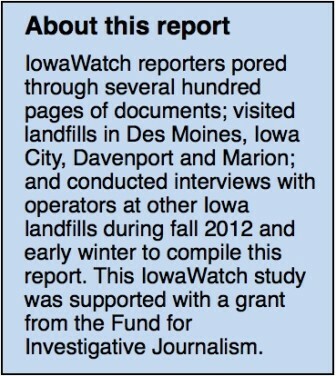 An IowaWatch investigation revealed that the gap between tons dumped into the ground and tons recycled at Iowa’s top five waste agencies is widening. And unless something changes, it’s set to stay that way because of a lack of available recycling programs, the way recycling and landfill programs are funded by the state, and poor record keeping. 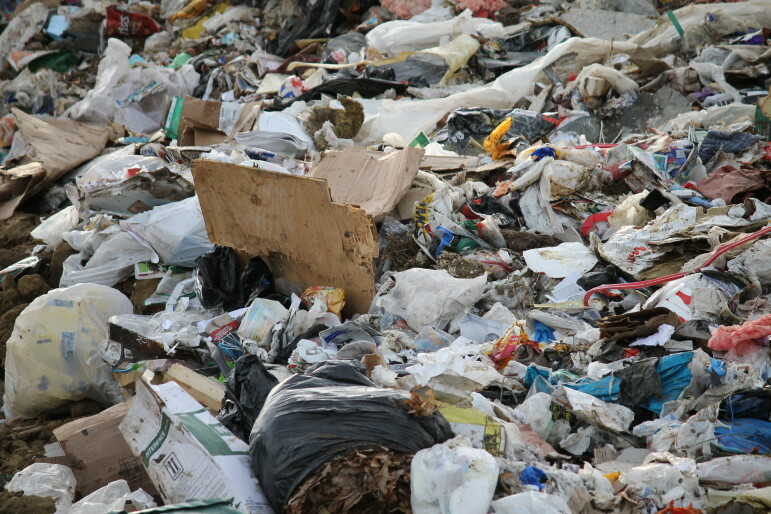 A little more than 2.86 million tons of trash were dumped in landfills across Iowa in fiscal 2012, which ended June 30. That’s about the same as the previous year’s amount. The Iowa Department of Natural Resources’ yearly landfill tonnage reports reflect no dramatic decrease or increase in total tonnage over the past 10 years. However, available state reports analyzed by IowaWatch suggest that the percentage of refuse being recycled versus what is landfilled is decreasing. The Cedar Rapids/Linn County Solid Waste Agency, one of Iowa’s top five landfills, had a recycling rate of 9.1 percent of what was dumped into the ground in 2002. As of last year, that rate had fallen to 5.4 percent, the IowaWatch analysis showed. The Scott Area Landfill recycling rate dropped from 8.8 percent of what was put into the ground to 5.3 percent during that time, the analysis showed. Moreover, one-fourth of all the garbage taken to a landfill in fiscal 2011 was organic material – food and yard waste, textiles, leather, diapers, and rubber, according to a 2011 Iowa Statewide Waste Characterization Study conducted by the Iowa DNR. Data for 2012 were incomplete. Environmental scientists say this organic material should be diverted from landfills because it produces the greenhouse gas methane while decomposing in the ground without oxygen. The state’s waste study showed that at Iowa City’s landfill and recycling center, which has an aggressive recycling program, 27.5 percent of the waste is paper, 25.4 is organic material, and 21.3 percent is plastic. “We’re all paying to throw perfectly good stuff away, every day,” Jen Jordan, the city’s recycling coordinator, said. This year marks the 25th year of Iowa’s recycling program. That program also initiated what is known as the tonnage fee. By law, landfills must pay the state DNR fees for each ton of waste that enters their facility. Those tonnage fees range from $3.25 to $4.25, depending on the landfill’s recycling efforts. Easy access is necessary for successful recycling programs. It also is the biggest challenge at the Cedar Rapids/Linn County Solid Waste Agency, said Joe Horaney, the agency’s communication director. In rural areas of the state, curbside recycling is even harder to come by. Contributing communities to the state’s second largest landfill, located in Mills County, have no program for curbside recycling. So unless a deal is worked with a private hauler, these small communities must transport their recyclables to the recycling facility in Council Bluffs. Robert Glebs, CEO of Iowa Waste Systems, which manages Mills County’s landfill as well as the Montgomery County Landfill, said the company has a hard time getting smaller municipalities interested in recycling. Another hassle is the effort people need to make to separate recyclable materials. Operators at the Scott Area Landfill, in the Davenport area, are considering a shift from dual-stream — which requires recyclable waste to be separated into paper, bottles, plastic and the like — to single-stream recycling. By taking the sorting responsibility off the shoulders of citizens, they hope to boost residential recycling participation. “It has to be a very streamlined effort (with the city), so it’s going to be a lot of work,” Brandy Welvaert, the landfill’s communication coordinator, said. But experience has shown that switching to single-stream recycling increases what people recycle, Welvaert said. Despite efforts like those in Scott County, and the fact that how much waste agencies pay the state depends on how much is dumped, Iowa has a poor system of keeping records on recycling at landfills. Although the DNR tracks exactly how many tons are dumped in Iowa landfills every fiscal year, it does not track how many recyclable materials are dumped. So, while some data exists at the county level about curbside collection, no specific statewide data exists for recycling tonnage. The state does not require tracking information about recycling. Even if it did, tracking recyclable content would be a challenge. “Data is only as good as the person who collects it,” Glebs said of the struggle he has experienced in getting accurate data from haulers to the Mills County Landfill. The landfill’s top six haulers are the only ones keeping recycling records. Glebs said knowing recycling data would help guide his landfill’s recycling program in terms of where to focus efforts. Additionally, waste comes from public and private haulers in loads that aren’t easily separated. So even for landfill officials, it is hard to know exactly what is within the tons being dumped into their landfills. This active cell is a part of Phase 2 disposal area at the Metro Waste Authority’s Metro Park East Landfill, which will be developed up to 264 acres. The disposal area is expended about 10-acre every two years. Phase 2 disposal area is anticipated to serve through 2053. With double the tons landfilled of the closest competitor in Mills County, Metro Waste Authority’s executive director, Tom Hadden, considers planners for Metro Waste to be lucky. “We have plenty of room for expansion. Others do not,” Hadden said. By plenty, Hadden is referring to land Metro Waste has purchased that is set to cover needs for the next 100 years. 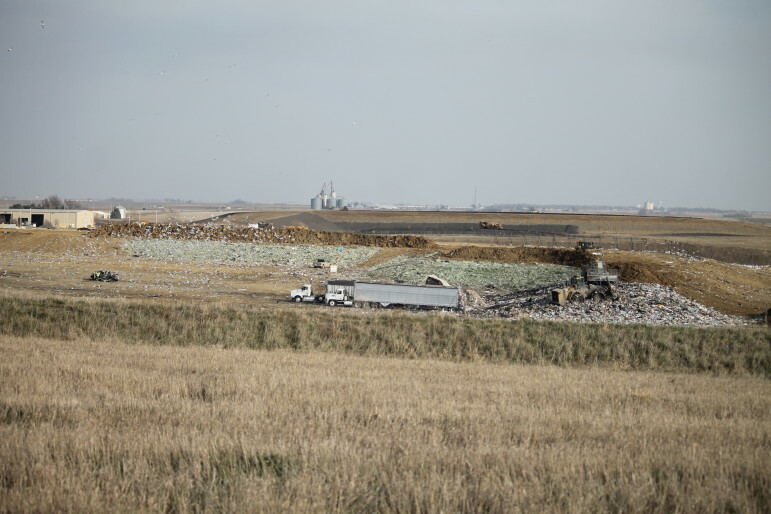 Other landfills face rising land and garbage costs, or even needing to resort to trucking garbage to another state with cheaper landfill rates. Some of that already is happening. Nearly 81,000 tons of Iowa’s garbage was trucked out of the state last fiscal year. But that’s nothing compared to what’s coming in. In 2012, other states sent Iowa more than three times the waste that Iowa sent out. Another concern about state recycling is how landfill recycling programs are funded. The main revenue source for waste reduction and recycling programs is the tonnage fee collected from landfills by the Iowa DNR. In other words, the DNR relies on a certain amount of waste being buried in landfills in order to fund recycling programs. Last year, the Mills County landfill gave $500,000 in tonnage fees to the state DNR – money that does not necessarily come directly back to the landfill. Mills County’s fees, instead, were sent to fund Council Bluff’s recycling center. Glebs said the landfill luckily is able to manage recycling programs with the support of its own collection fees. But seeing some of that DNR money come back would help with expansion and improvement. Additionally, waste reduction goals grant landfills the chance to decrease the amount they pay to the DNR based on whether or not they meet reduction goals. A state mandate in 1988 set a 25 percent waste diversion goal for Iowa landfills by 1993 and a 50 percent goal by 2000. Incentives for landfills include reducing their tonnage fees if they meet these goals. The data are collected every five years. They are based on state landfill tonnages that are adjusted for population and economic factors. Most Iowa landfills have managed to divert 25 percent of their waste compared to original 1988 levels, state reports show. However, progress has stalled, with the state average only reaching 35 percent diversion. Jennifer Fencl, environmental services director at the East Central Iowa Council of Government Solid Waste Planning Agency, said the six landfills that agency manages hit an average peak diversion of 40 percent in 2000. Since then, though, that percentage has tapered off. Eleven years later, diversion had fallen to just 33 percent. The large majority of Iowa landfills have struggled to reach the state’s second diversion goal, although Mills County is an exception. Thirteen years after the 50 percent diversion goal was supposed to be met, Mills County Landfill is managing to divert a little more than 75 percent of its waste, according to recent DNR reports for the last fiscal year. Landfill operators credit this to the high volume of industrial waste it receives and is able to reuse for its daily operations. Automotive fluff from a nearby car shredding plant, foundry sand and contaminated soil from an EPA project in Omaha are all used as daily cover — a six-inch layer of material added to the top of waste piles each day. Tormey called the baseline of this 25-year-old program questionable because of other factors that affect the baseline. “I really think we have got to look at providing incentives,” Tormey said. He used Minnesota’s recycling system as a model for his incentives proposal. There, a solid waste management tax is applied to garbage fees of residents and businesses. Since 1997, though, no tax is charged for recycling waste. One landfill that is not receiving any cuts on its tonnage surcharge is the Northwest Iowa Solid Waste Agency and Recycling, near Sheldon. Larry Oldenkamp, the landfill’s manager of three years, said it is not reaching the 25 percent diversion goal. Oldenkamp said progress is hard to gauge, but the main problem is the lack of recycling from businesses, which produce about two-thirds the state’s solid waste. Some of Iowa’s largest waste agencies have started to do away with the 25 percent diversion goal. Metro Waste is one of them. The compost from the yard and food waste at the Iowa City landfill. 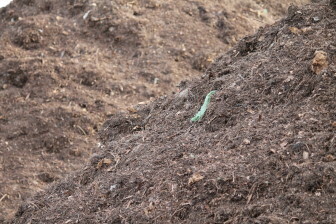 It takes about six to eight months for the materials to break down into compost. The temperature inside the compost pile can be as high as 140 to 150 degrees, Jen Jordan, the recycling coordinator of the Iowa City Landfill and Recycling Center, said. These landfills have adopted, instead, a system called the Environmental Management System, or EMS. This system takes a holistic approach to environmental landfill goals, with six focus areas – recycling, greenhouse gas, water quality, yard waste/composting, household/hazardous waste, and education. With this program, Iowa landfills record efforts being made in each focus area, set goals and objectives, and try to meet them. Yearly reports are made to the DNR and waste agencies that achieve the EMS goals receive a tonnage fee reduction of 85 cents per ton. Six Iowa landfills, including Metro Waste Authority, Scott Area Landfill and Cedar Rapids-Linn County Landfill, were part of the pilot EMS program. 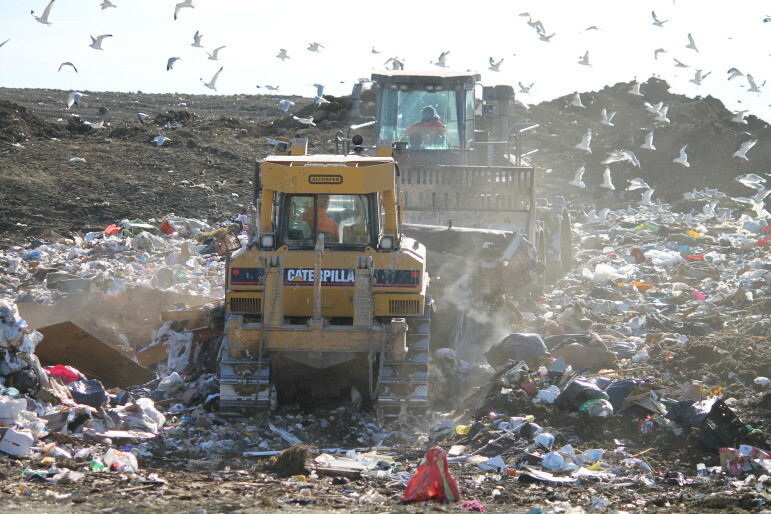 Iowa City’s landfill is starting EMS efforts. Hadden, of Metro Waste Authority, said the 25 percent diversion program did not take into account several services that help protect the environment. The Environmental Management System gives landfills credit for all of their environmental efforts. This IowaWatch story appeared in The Des Moines Register, The Gazette (Cedar Rapids, IA), the Quad-City Times, Sioux City Journal, Mason City Globe Gazette, Iowa City Press-Citizen, ABetterIowa.com, dmjuice.com, the websites for the Altoona Daily Herald, Indianola Record-Herald, Indianapolis Star and Asheville Citizen-Times, Midwest Center for Investigative Reporting and Fund for Investigative Journalism. Versions of this story, using our report as the basis, were the Marshalltown Times-Republican, Prairie City News and USAToday and on KCRG-TV (Cedar Rapids, IA), KTVO-TV (Ottumwa), WHO radio (Des Moines, IA), WMT radio (Cedar Rapids, IA), KXIC radio (Iowa City, IA) and other Clear Channel radio stations in Iowa.